The interim government in Kyrgyzstan claims it now has the situation in the country under full control and aims to unite and stabilize the country, told RT Temir Sariev who is the deputy head of the new administration. RT: We are here today to talk about Kyrgyzstan, the government and its future. Thank you for joining us. Would you mind telling us a little about the interim government and what do you stand for at this moment in time? Temir Sariev: After the uprising on April 7, the interim government was formed which consists of 14 members and leader Rosa Otunbayeva – the Chairman of the Interim Government. There are several deputies. I am a deputy and at the same time Minister of Finance. Each deputy has their own responsibilities. Due to the fact that the institute of presidency was eliminated, the interim government fulfills three functions. First, it works as a government, secondly it performs the representative functions – in other words it fulfills the president’s role. And because parliament was dissolved, it performs the parliament’s functions as well. So it is the only governmental body which has taken responsibility for constitutional reform and the presidential and parliamentary elections. Before the elections, the interim government will fulfill all of the functions I have mentioned. At the moment we have full control of the situation in Kyrgyzstan. There are a few local problems like in Dzhalal-Abad and in Osh, but these problems are being solved by means of public diplomacy, auxiliary police, and the military. The people of Kyrgyzstan have shown that they are ready to fight for their freedom, democracy, and independence. They have shown and proved that they are ready to protect their freedom and democracy. That is why all around the country there are military personnel who provide law enforcement and security and enable the operation of all the authoritative bodies. There are attempts by the previous authorities to return to power. But we think that the changes are irreversible. And anyone who disputes this is out of their mind. Our main task is to enable the adoption of the Constitution by means of a nationwide referendum and to hold an open and fair election. Any other ways of forming the authoritative bodies are inadmissible. Talks about establishing a strong and severe rule and bringing security officials to power have no grounds. People will not let it happen. It is true that the interim government makes mistakes; it is because we are trying to apply the methods of corporate management. There are disagreements because different political forces have various views. But for the sake of stability, political and economic reform we will find the way to make decisions, and implement them. RT: Going back to the events of mid-April – tell us a little bit about how that was organized and how it was decided to go ahead and take over Bakiyev’s administration. TS: On March 17 we formed the Central Executive Committee which organized a people’s conference – Kurultai. We decided that on April 7 all around the country we would hold people’s conferences demanding political reforms. We had a number of complaints starting from the president’s refusal to add a constitutional amendment to establish a consultative democracy. Secondly, we wanted the president to fire his close relatives from high positions, to eliminate non-constitutional bodies like the Central Agency for Development, Investments, and Innovations, headed by the president’s son Maksim Bakiyev. We wanted to return to the people illegally privatized companies – KyrgyzTelecom and energy companies which were sold at a very low price. So those were our claims and we planned to organize a conference on April 7 and go onto the streets and put public pressure on the government to make it quit. But the authorities decided to suppress the people’s complaints and on April 6 they provoked a conflict in Talas and worked out a plan to arrest all the opposition leaders – which they carried out. I was in Moscow at the time, but I was arrested on my return on the morning of April 7 at Manas airport. The fact opposition leaders had been arrested was a strong stimulus for the people to act, to put forward radical claims and to go into the streets. At midnight many local authorities took the side of the people – some of the officials left their posts and fled, and people gathered on the central square of Bishkek. 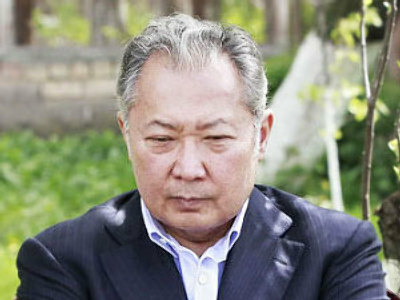 Of course the authorities used arms and opened fire on the peaceful residents which in the end led to Bakiyev’s escape. 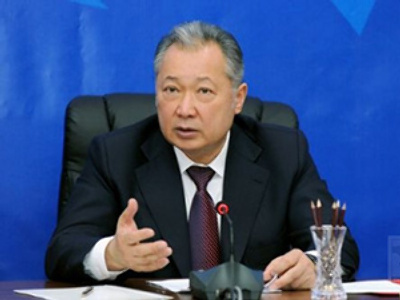 RT: Is it the opinion of this government that Bakiyev and his Administration have blood on their hands for the violence and the bloodshed that happened during this switch of power? TS: Certainly! They provided the military with live ammunition which is banned during peace time, and they had special arms, and used snipers. The majority of the people murdered then were killed with a shot to the head or neck. It was a prepared military operation. We have proof that on the eve of that event there was a meeting. Then they organized a command staff that was giving direct orders saying that they needed strict measures and that shooting may be required. They thought they would kill a few people and the others would stop. The OSCE had been providing a lot of arms for the police, including special weapons, and the police were being trained to break up demonstrations. But they did not need those skills, as they used live ammunition. They started shooting on Bakiyev’s order. The first murders were the fault of the authorities. When the first blood spill took place, the people had no choice. They were so infuriated that they could not stop then. So they dragged away the wounded and the dead and carried on. RT: Now moving to more recent events. In the south [of Kyrgyzstan] there have been more uprisings, Bakiyev’s people have gathered together. Does this government have control of this situation? And is this country divided to an extent and can it be reconciled through talks? Some people have even suggested splitting Kyrgyzstan into two. TS: Yes, there are such forces who want to take advantage of the situation, to come to power. One person has recently been arrested and put into a detention facility, where he is being questioned. I am absolutely sure that Kyrgyzstan will not split and will continue to be one state and its people will be united. The people’s wisdom, Kyrgyzstan’s patriots and responsible people will not let it happen. And no matter what they say about the existing problems, they won’t manage to divide Kyrgyzstan, the southern and northern parts, and the people into two. We can stop such thoughts and attempts. Yes there are problems in the South of the country, but they are local and mostly created by Bakiyev’s followers. Today the interim government has full control over the situation in the country. There was an operation in the cities of Osh and Dzhalal-Abad. Bakiyev’s followers used snipers and as a result many people received gunshot wounds and two died. 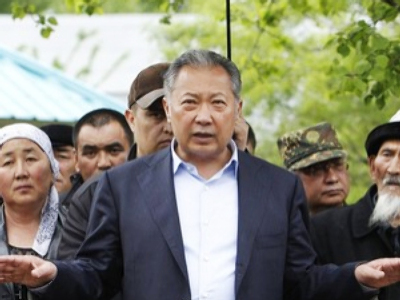 Now the residents of Dzhalal-Abad and Bakiyev’s close relatives know how bloodthirsty he is. We can call it an attempt at counter action on the part of counter-revolutionaries. They failed to start a counter-revolution; and the people saw the real intentions of the organizers. So I think it united the south and the north even more. The Kyrgyz people have very good intuition. They always get together in a moment of danger. They felt that if they had continued to endure Bakiyev’s rule, they would have lost all democratic gains. They united against him and kicked him away. Now there is another reason to come together. So we have repeatedly proved to the international community that our society is very mature, the people are active and love freedom and independence, and we will build relations on the basis of democratic gains. RT: The international community – specifically the UN, the United States and Russia – have all expressed interest and have opened dialogue on the situation in Kyrgyzstan. What is your experience in working with the international community, what sort of support did you have and what sort of dialogue did you have with different countries? TS: There is a legal problem – the legitimization of power. We realize that many countries would like to deal with a legitimate government. We are doing everything possible. Although de facto we are recognized by almost all countries, because we provide for the order and security of Kyrgyzstan. It’s so that all the authoritative bodies can still work. The power can be legitimized only after the referendum. The international community and major countries have provided help. Russia was the first country to provide help and all kinds of support including financial assistance, giving us credits and grants as well as humanitarian aid. We also received humanitarian aid from other countries: China, Kazakhstan, the US, and from the European Union. And we continue to receive aid. Many international organizations like the Red Cross greatly supported us. We are expecting a delegation on behalf of the International Monetary Fund together with the World Bank who will assess the situation. On July 8 there is going to be a big Blood Donation Forum during which a programme of support for Kyrgyzstan is going to be adopted, including financial help. So we feel the international community’s support, because we are settling into a normal way of life in the region and providing stability and security. Nobody is interested in having a center of destabilization in Central Asia. I think that our views correspond to the views of the international community on this issue; and the new interim government is ready to work and co-operate on these issues. RT: Is the interim government that exists now the right move for Kyrgyzstan, and can it lead to a better future for this country? TS: Yes, we will lead it to a better future. Of course our time is limited, and all the major programs will be adopted after the new government is formed, after the parliamentary election on October 10. We hope that the draft of the constitution proposed by us will be approved. Once it is approved the parliament will be formed on the basis of the party list, and the winning party or coalition will have the opportunity to form the government. We have decided that before that we act step by step. You might have noticed that we are now starting to remove the barriers and mechanisms which were corrupt and hindered us. To achieve all that we need a transparent and pure government. And a pure government can be formed only on the basis of free speech of free will.